In the last post I showed you guys how to sum/subtract to matrices of the same order. 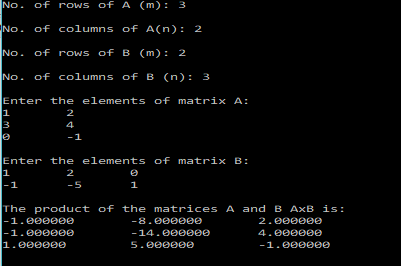 In this post I will show you how to write a C program that gives the product of two matrices. The product of two matrices isn’t always defined. is defined only when the no. of columns of is equal to the no. of rows in matrix . With the above, information, we can proceed to write a simple program, to multiply two matrices of given sizes. We would also need to check whether the matrix product is defined or not. The program is pretty much self-explanatory. 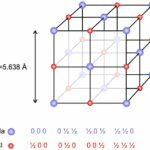 The above program, could be made cleaner and better by using separate functions for reading and printing the matrices, as well as calculating the product. For the function that calculates the product, I would have preferred to have the function return the matrix product, but unfortunately, C doesn’t support returning arrays from functions. 1. We create a matrix called prod in our main program and then pass it as a parameter to the product function, which would then populate this matrix with the product. Note, that in C when you pass an array as a parameter, you are not passing it by value like it happens with variables, but rather you are passing a reference to the array itself. So when you pass the matrix that stores the product, the original matrix will be modified. All of this can work out for us without much hassle. 2. Another, option would be to use pointers. We would use malloc to create our product matrix in the function to allocate sufficient space. And then return the pointer to this array. This would be a dynamic allocation. The following codes illustrate the above procedure to multiply two matrices.